Promotional Spaceman Light Up Futuristic Sunglasses are good for the promotions of nightclubs, concerts and also any other promotional activity planned at night. Get an out of this world brand image by presenting them to the guests and invitees of the party. These custom party sunglasses are presenting 3 LED functions such as steady, quick flash and slow flash. Users can operate these functions by pressing the push button placed on the battery pack at the back of the ear. 3 replaceable AG13 batteries are the power source of these custom sunglasses and they are also included in the pack .Order now to grab our free artwork design and free online proofs facilities. 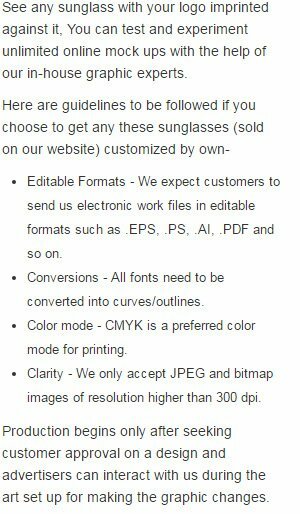 Request a quote to know what you can save on ordering Promotional Spaceman Light Up Futuristic Sunglasses. LED Colors: 4 Blue, 2 Green, 2 Red. LED Functions: Quick flash, Slow flash and Steady. Imprint Area: 1.7" x .3"
Additional Information: Includes 3 replaceable AG13 Batteries, Activated with a push button located on a behind the ear battery back. When ordering blank items of this product either exactly 1 or atleast '+96+' must be ordered!